Michael and I started our journey back home about 6 hours before departure to Doha to take some photos at Phuket airport. Unfortunately winds were blowing from west so there were no approaches over the beach. So we decided to go into the terminal and wait there. 4 hours later and after an eternity period of waiting we made our way to Qatari's check-in desk. Because Michael hit his silver status at Privilege Club he got a free lounge ticket and we both quick access through security. While Michael enjoyed his stay at Coral Executive Lounge I went to the airport's smoking area from where you have a good view over the western apron and Nai Yang Beach. There I saw a several A330 from Thai, Cathay Dragon, Etihad and Lion Air as well as a few Air Asia A320. We planned to meet at the gate 75 minutes before departure as Qatar usually start their boarding one hour prior departure. Michael brought me a beer, a coke and a little bread because I didn't eat anything the whole day. With just a little delay we went down one floor and saw our aircraft that would bring us safely to Qatar for the first time. 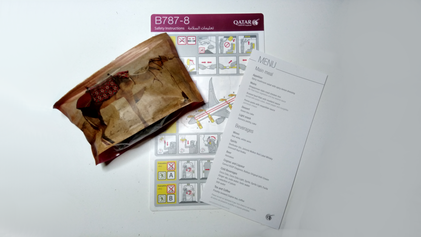 It was A7-BCK, a in 2013 to Qatar Airways delivered Boeing 787-8 Dreamliner with line number 62. Our boarding passes where checked for the second time in 10 minutes and after that we finally could board the aircraft. This time nobody was reseated, so I sat down next to Michael on 24J. We decided to sit at least one flight next to each other and as this flight would be a night flight, we decided to do it on this one. Both GEnX were fired up and we taxied to runway 27 and took off beautifully. Right after takeoff the flight attendents handed out the menues. Michael went with the singaporean style roast rice while I chose the braised beef fillet with mustard sauce. With that we enjoyed beer and whiskey...not at the same time of course. Both meals tasted very good. The economy class seat on Qatari's Dreamliner is quite comfortable, the legroom is adequate but there is one huge disadvantage: The IFE box (that's the computer running your IFE) is located right under the seat in front of you. I don't know from which century this box is but it is way too big. 45 cm (17.7 in) is an average seat height and it is enough to put your feet and legs under it. With that IFE box under it you probably have 20-25 cm causing your feet falling asleep after a while. Right after finishing our meals Michael and I tried to walk around which was a bit tricky because the flight attendants were really slow with serving dinner. But it was great to stand a bit and talk. Later, somewhere over the ocean we decided to take a short nap I woke up somewhere over india to watch a movie. I went for the 6th Star Wars movie but was so tired after a while to sleep again. We both woke up when the flight attendants turned on the mood lighting and served a light snack and either coffee or tea. Shocked therefrom we left for the lounge. 2 hours prior departure we woke up to eat a snack and drink some coke. Tired as f*** we left the lounge to travel across the entire terminal. Our mood was pretty bad because this flight should be a A350-1000 flight but now we had to wait for an old Boeing 777-300ER. When we arrived at the gate the mood got even worse. First, it was a bus gate and second an A350-900 stood next to our gate. By the way the flight was downgraded to a 777-330ER because on of two A350-1000 was at Farnborough Airshow and the other one had to fly to Teheran...once again thanks for that Qatar. After 45 minutes of waiting, three boarding pass checks and a bus ride of ten minutes we left the bus to go into 38°C / 100 °F before we could board our plane. BUT there was one thing that let us both smile - we would fly with an oneworld alliance special livery from Qatar Airways, A7-BAG. This time we both had a great wing view and so we took some photos while waiting until boarding was complete. The captain and purser welcomed us onboard and a few moments later we were on our way to runway 34L. 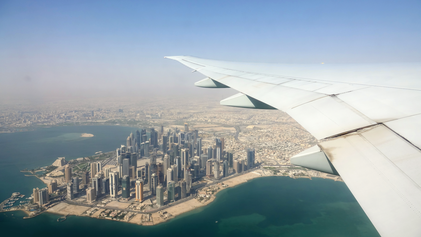 After takeoff we had a wonderful view over Doha and a soccer stadium which was under construction for the world championship in 2022. When the flight attendents walked through the cabin to announce that we may sit wherever we want, Michael and I looked at us and shook our heads. Instead of using the smaller A350-1000 or even the -900 they had to operate the flight with the large 777-300ER. On this flight Qatari served breakfast, we both went with some pancakes that were actually really good. In parallel I watched some more Star Wars. As we flew further north the terrain changed drastically. More and more trees appeared, no more dunes and less mountains. We flew over the black sea, over Balaton in Hungary. Somewhere over southern Germany we started descending. The weather was great by the way. A few small clouds and we were told that it would be a great day in Frankfurt. We landed safely on runway 25L (of course no 25R landing for this in total disappointing journey with Qatar) and taxied to gate B45. All in all this flight was the most pleasant flight of all four but I really don't know why...maybe because we both knew that it was finally over...and to quote Michael after this journey: "Never again with Qatar!" The flights in total were okay but nothing special especially for a Five-Star airline like Qatar. Equipment change for no reason, no space in the 787, old cabin layout in both B777 and the fact that Qatar Airways only is allowed to fly through corridors in the gulf region because of sanctions is not a good promotion.